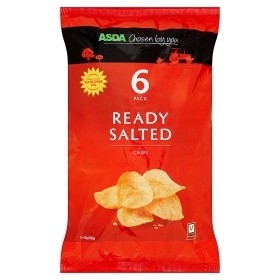 These Crisps were a little more crunchy than others in the range. The first couple of bites featured a snappy crack and crunch before this deteriorated fairly quickly to the mashed potato stage. These Crisps looked very much like you would expect supermarket own brand Crisps to look like. There were some curly and bendy Crisps, but most were fairly flat. They were generally an oil soaked pale yellow colour. There was the odd brown area here and there was also minimal seasoning visible. A Nose Plunge Test revealed a somewhat oily potato aroma. With the Sunflower Oil accounting for a third of the ingredients (along with potato and Salt), it is perhaps unsurprising that a warm, fluffy, oily, slightly salty potato emerged as the flavour within. Some Crisps were a little more salty than others, but overall it was a Steady Eddie sort of Ready Salted version.